Neumann have long been synonymous with high quality, professional recording equipment and this range of near-field monitors do not detract from that reputation. 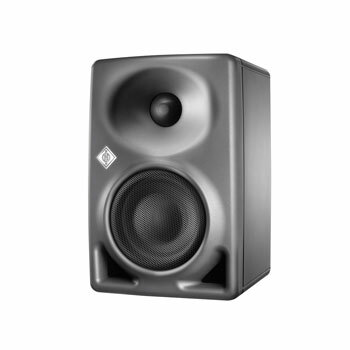 With choices of output power, speaker array, format and colour, the monitors have been designed to cater for professional requirements in recording or mastering studios, OB vans, broadcast and film production. A two-way, active near-field monitor, this has been designed to suit smaller studio environments such as project studios, OB vans, post production as well as mixing and mastering studios. 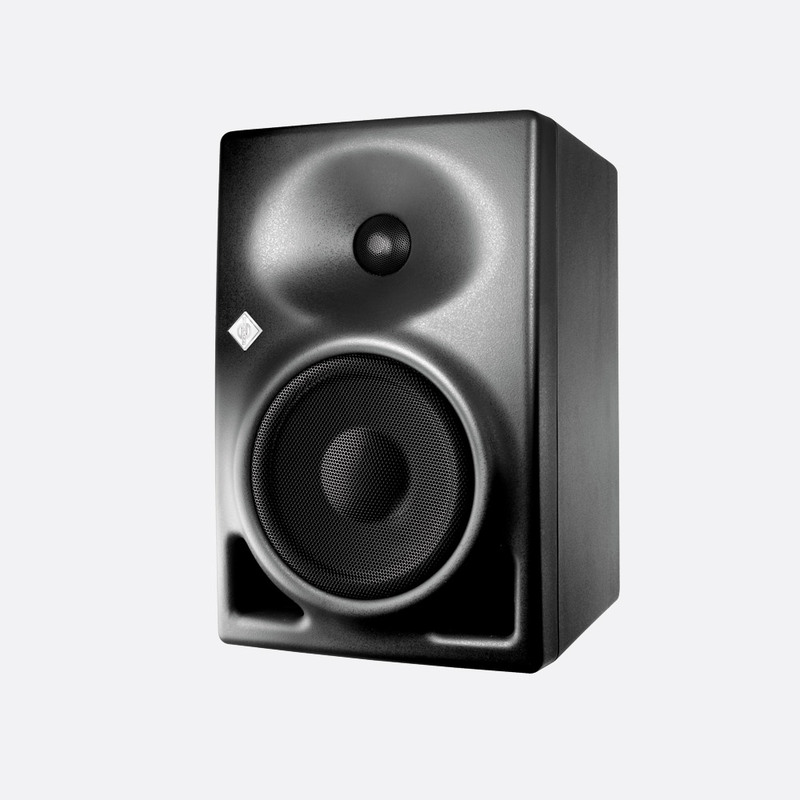 With a small footprint of 154 x 194mm (WxD), these studio monitors can also be used as rear loudspeakers in multi-channel systems. The class-D 120W (LF) and 70W (HF) amplifiers combine with the four-inch LF driver and one-inch tweeter, to give a wide frequency response of 53Hz - 22kHz at -6dB and 57Hz - 21kHz at -3dB and a maximum SPL of 108.8dB at 1m. 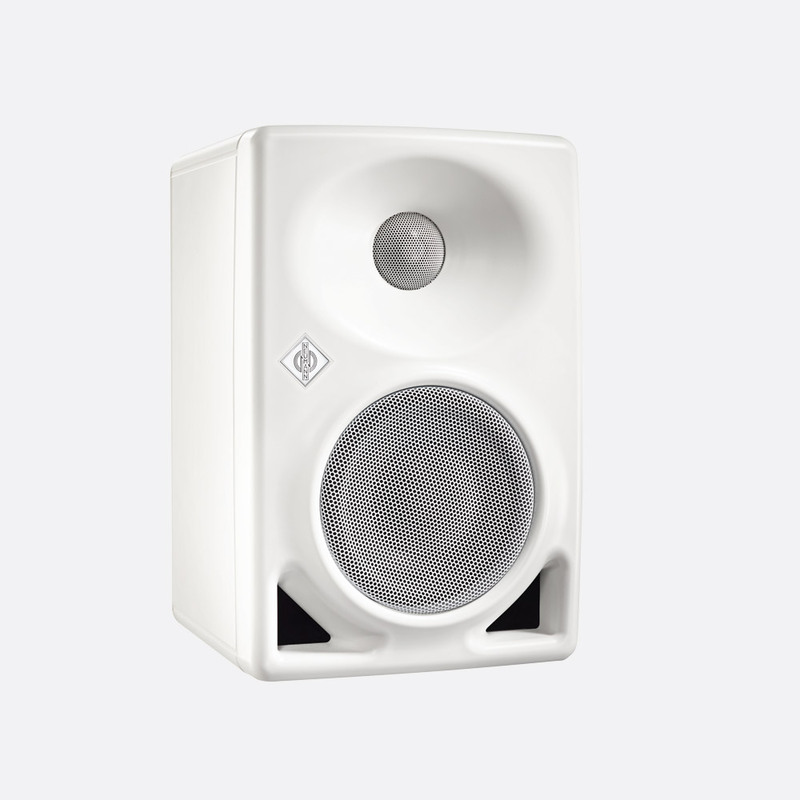 Both drivers have black, integrated, metal grilles for protection, and the two front facing, bass-reflex ports help to position the speakers in small spaces. 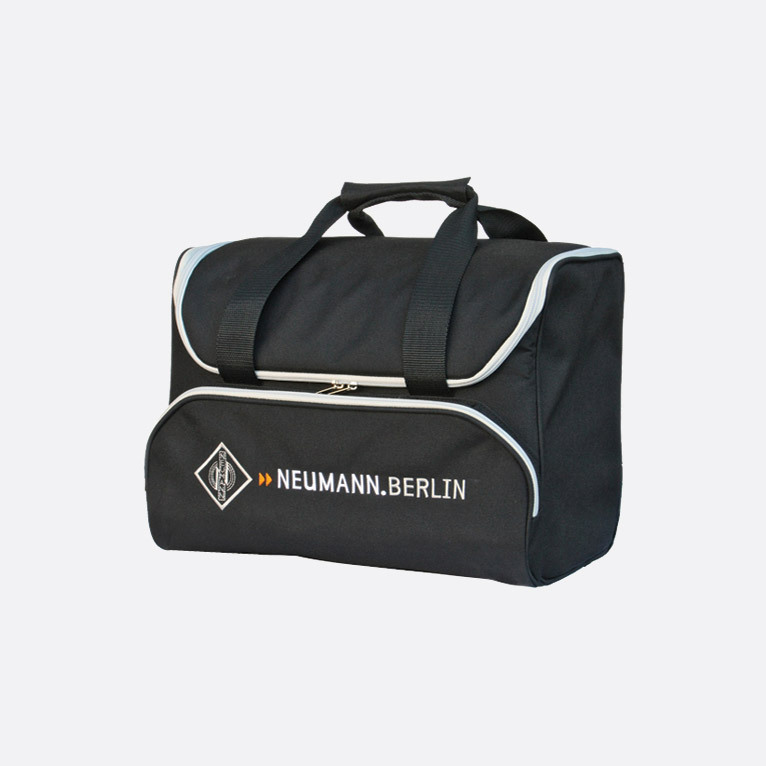 The front facing panel also features an illuminated Neumann logo, which among other identifying signals, shows white under power on, rose for identification mode and red when limiting or sensing error or clipping. 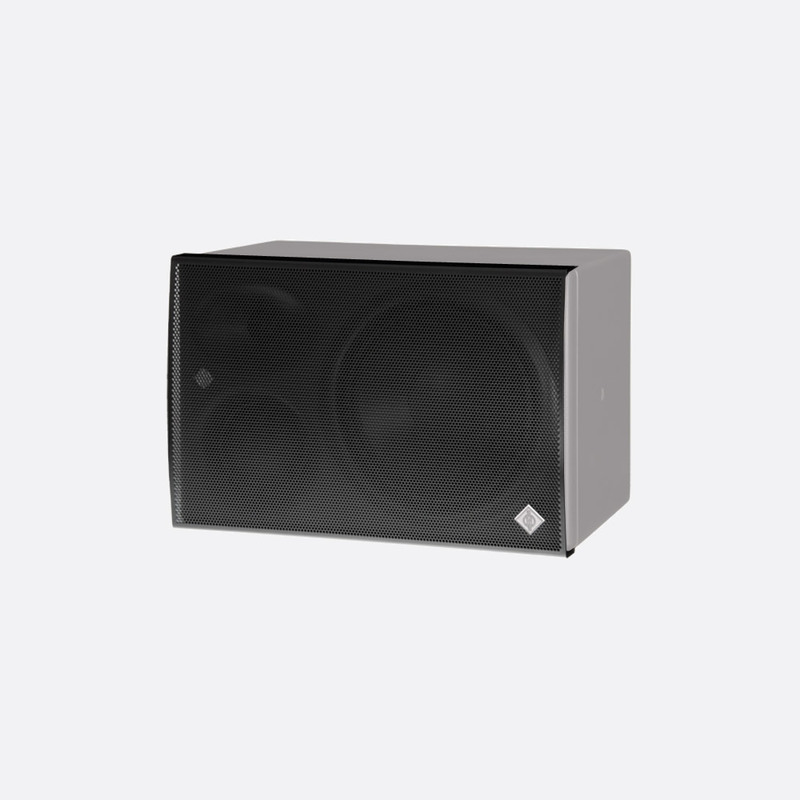 All connectivity and user-controls can be found on the rear of the loudspeaker, including electronically balanced XLR/Jack combination input and RJ45 connection for IP network compatibility using CAT5 or better cable. At the rear top of the loudspeaker, four controls can be used to adjust the input gain (rotary control), the output level (4-way switch), local/network control, and 'Low Mid' 'acoustic control' which allows the user to set the location of the monitor; 'free-standing', on a 'small desk', 'medium desk', or 'large desk'. Switching the latter of these switches enables the user to reduce the low-mid frequencies by 1.5dB, 3dB, or 4.5dB or leave at 0db flat response. AC power input is by way of 'figure-8 socket, to take an IEC C7 connector, and power on/off by way of latching rocker switch. Auto standby is 90 minutes by default, however this can be adjusted or disabled using connected compatible software. Available in white (KH 80 DSP A W) or metallic anthracite (KH 80 DSP A G). Power consumption: 9W, idle; 180W full output. Dimensions: 233 x 154 x 194 (H x W x D) mm. Weight: 3.4kg. Optional accessories: LH 43 surface mount plate, LH 45 wall mount, LH 46 ceiling mount, LH 47 adapter plate, LH 48 adapter plate, LH 61 adjustable L-bracket, LH 65 table stand. 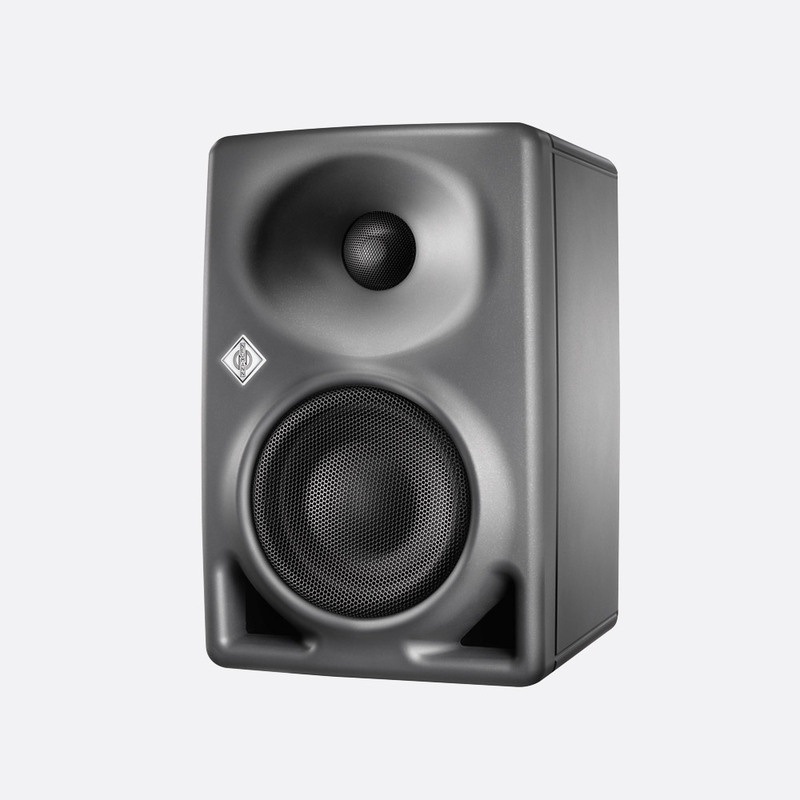 Available in metallic anthracite (KH 120 A G) or white (KH 120 A W), the KH120a has been designed for near field monitoring in mixing or mastering studios and broadcast studios or as a rear loudspeaker for larger multi-channel surround systems often used in post-production studios. Driven with two class AB amplifiers, both of 50 watts continuous (80 watts peak) power, the KH 120 A can offer a frequency response of 52Hz - 21kHz and a maximum sound level of 107dB SPL, 97dB maximum SPL long term with music playback. Both 5.25 inch LF driver and 1 inch titanium HF dome are magnetically shielded. An illuminated Neumann logo is white under power on and red when limiting or clip sensing. The rear facing side of the monitor has all connectivity and control including a rotary gain control, switchable output level, and three switch bass/low-mid/treble controls. Analogue input is via electronically balanced 3-pin XLR socket and AC mains connection is by way of IEC. A latching rocker switch is used for power on/off. Power consumption: 20W, idle; 200W full output. Dimensions: 277 x 182 x 220 (H x W x D) mm. Weight: 6.4kg. Optional accessories: LH 43 surface mount plate, LH 45 wall mount, LH 46 ceiling mount, LH 47 adaptor plate, LH 48 adaptor plate, LH 61 adjustable L-bracket, LH 65 table stand. This near field monitor has the same acoustic properties and optional accessory set as the KH 120A, however it has BNC I/O for AES 3 digital connectivity in addition to the analogue inputs of the KH 120 A. The KH120D also has lip-sync and 'time-of-flight' delay controls to align with other sources or to compensate for differing listening distances. The KH120 D is only available in metallic anthracite. Power consumption: 40W, idle; 200W full output. Dimensions: 277 x 182 x 220 (H x W x D) mm. Weight: 6.5kg. Available in metallic anthracite, the KH 310 A is designed to be positioned with the HF and MF drivers to the side of the LF unit and can therefore be purchased in left (KH 310 A L G) or right (KH 310 A R G) configuration. This 3-way active studio monitor has been designed with broadcast centres, OB vans, post production and music mastering and mixing in mind. Neumann have introduce a 'Mathematically Modeled Dispersion' wave guide to give a smoother off-axis response, to give a user more freedom of movement. 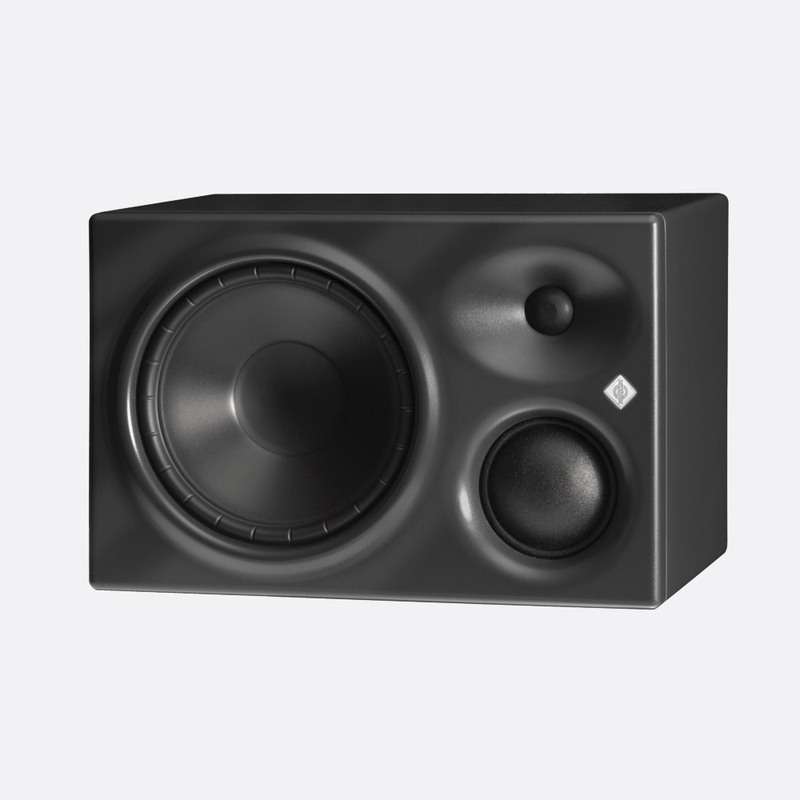 The class AB amplifiers with thermal protection provide 210W to the 8.25 inch LF driver, 90W to a 3 inch mid frequency driver and 90W to the 1 inch tweeter at peak output, to offer a maximum SPL of 116.3dB at 1m. 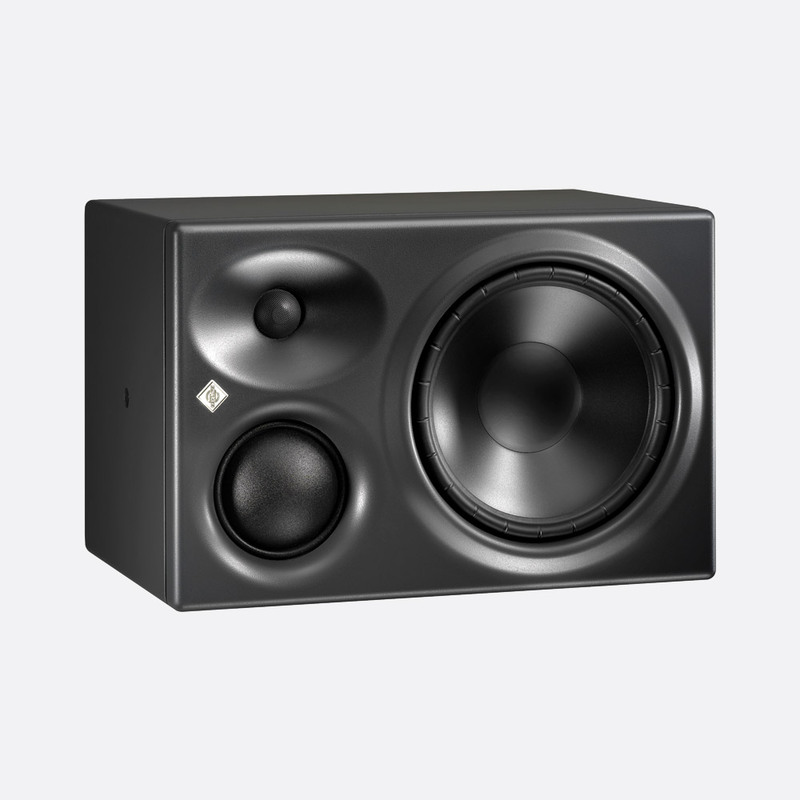 Independent excursion, bass frequency, mid-frequency, and treble limiters help retain the quality and durability of the near-field monitor. 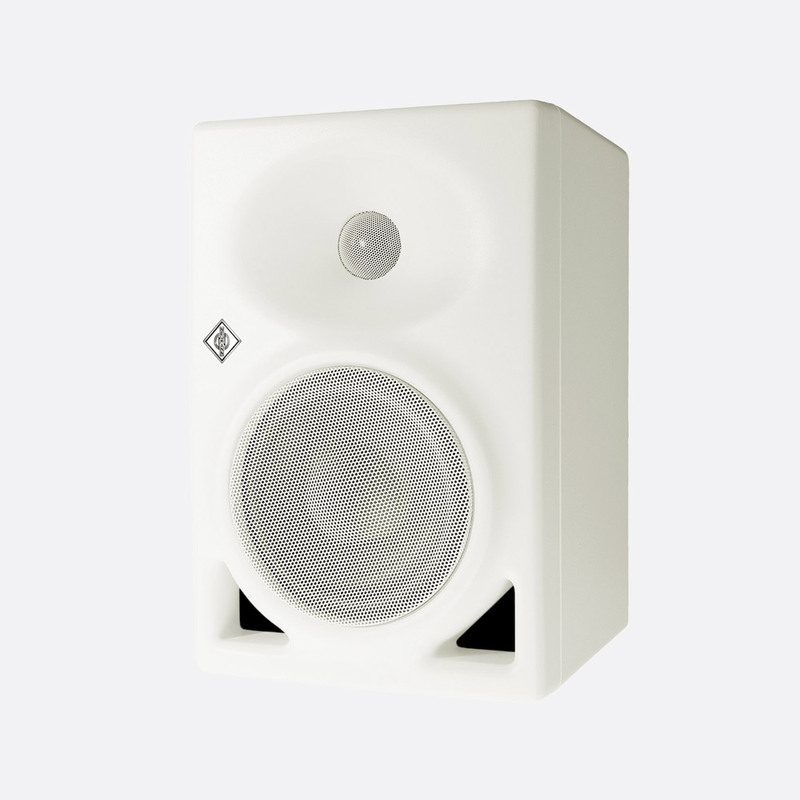 A free-field frequency response of 34Hz - 21kHz +/-3dB can adjusted further by way of three 'acoustic controls' on the rear panel that reduce the bass, low-mid and treble frequencies by set decibels to compensate for boundaries and positioning. There are also user controls for input gain (-15 to 0dB), output level (114/108/100/94dB), display brightness and ground lift. The analogue input is via a 3-pin balanced XLR socket, the AC mains input is via IEC connector and on/off is by way of latching rocker switch. Power consumption: 24W, idle; 300W full output. Dimensions: 253 x 383 x 292 (H x W x D) mm. Weight: 13kg. Optional accessories: GKH 310 metal grille, BKH 310 soft carry bag, LH 25 U-bracket, LH 43 surface mount plate, LH 45 wall mount, LH 46 ceiling mount, LH 47 adapter plate, LH 48 adapter plate. The KH 310 D near field monitor has the same acoustic and physical properties as the KH 310 A, however in addition to the analogue inputs of the KH 310 A it has BNC I/O and a 3-pin XLR socket for AES 3 digital connectivity. The KH310D also has lip-sync and 'time-of-flight' delay controls to align with other sources or to compensate for differing listening distances. Power consumption: 30W, idle; 300W full output. Dimensions:: 253 x 383 x 292 (H x W x D) mm. Weight: 13.1kg.